WHO is stealing the sunlight? WHERE have the clear blue skies gone? WHY are they dumping coal fly ash into the atmosphere 24/7? Don’t know about your skies, but ours have been full of chemtrails nonstop for many months. It’s been a constant procession of chemtrails and chembombs, followed by chemclouds that eventually cover the whole sky with a massive chemcloud cover. Perfectly blue skies are transformed into a sea of ever-changing chemclouds every other day now. These manmade clouds then spread out rapidly into a fabricated chemcloud cover that stretches from horizon to horizon. Day after day, week after week, month after month we have watched our sunny days and blue skies sabotaged by these chemtrails and chembombs. 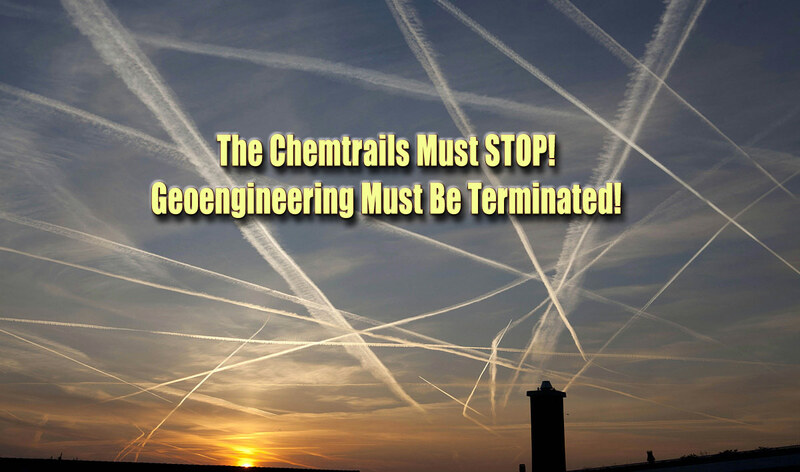 The geoengineers who have developed this chemical geoengineering technology claim that chemtrail operations don’t even exist. They have the chutzpah and gall to deny the ongoing worldwide chemical geoengineering programs that millions now see conducted overhead. The people of this planet want to know who is stealing our sunshine. Why do they lie about incessantly taking our blue skies and blocking the sunshine? When even the birds are becoming quite scarce, something is VERY wrong indeed. We don’t know about your neck of the woods, but ours has a lot fewer birds. Flocks of sparrows and cardinals no longer appear on our feeders. Visits from wrens, chickadees and titmice are far and few between. Bluejays, brown thrashers and mockingbirds are all becoming more scarce by the season. Are these and others species of birds dying slow deaths because of the chemtrails? 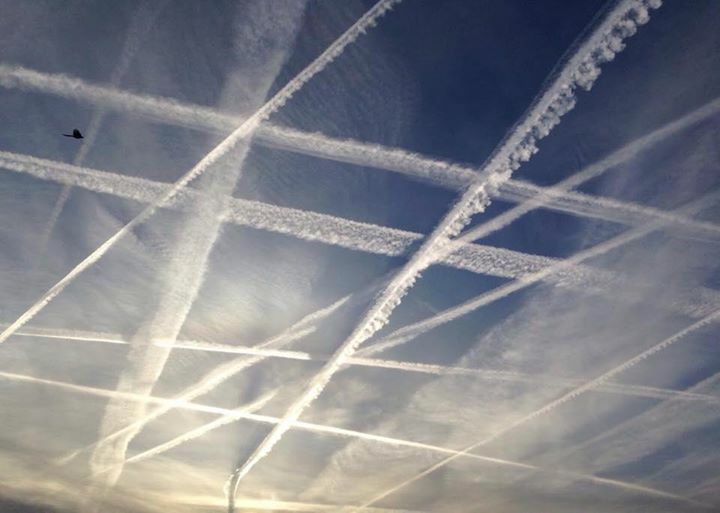 How can they fly through such toxic skies day after day after and not be adversely affected by the chemicals. Their delicate lungs and upper respiratory systems are under direct assault as they fly through the unceasingly chemtrailed air. In fact, the coal mine has been turned inside out. Coal fly ash, which is mandatorily captured in the smokestacks of coal-fired power plants, is the major ingredient of chemtrail aerosols. In other words, the coal fly ash that is a hazardous waste product of burning coal is first removed as regulated by the EPA, then it is dumped right back into the skies of America via the ongoing chemical geoengineering programs. 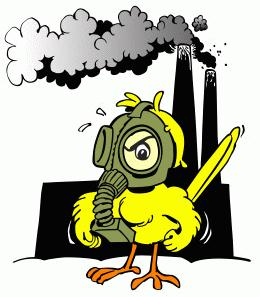 How can the birds ever defend themselves as they fly through such toxic skies day and night? Their scarcity and odd behavior at times must mean that, as the new canaries of the coal mine known as the post-modern civilization, we are in deep, DEEP trouble. Deep trouble indeed we are in when the vast majority of human beings are so oblivious to what is happening right above their heads. What, pray tell, is more important than the quality of air that we breathe — 24/7?! ANSWER: There is nothing under the sun that is more important than the quality of air that we breathe. During 2015 the ‘trails were never so frequently laid down morning and afternoon, evening and night. The weather patterns also changed accordingly. A lot more chemcloud cover, a lot more rain out of season, and many low pressure systems even during the normally dry and clear months have become the new normal. Now in 2016 the chemtrail activity has been ramped up even more. What is the reason for this? Why is the number of days of sunshine decreasing precipitously? The following TED video presentation by geoengineer David Keith is quite telling. Mr. Keith has been set up as one of the establishment geoengineering scientists who aggressively promotes the chemical geoengineering of our skies. He is now regarded by many as the Chief Geoengineer of the NWO agenda. Along with Ken Caldera of Stanford, he utilizes his high-profile platform of Harvard to bring gravitas and academic authority to the spurious applied technology known as chemical geoengineering. When you watch this video you will quickly understand why humanity is in such “deep trouble”. Truly, the craziest among us are now ruining running the asylum known as Planet Earth. Now you know why TPTB trot the mad scientist onto the sets of all Stephen Colbert type shows peddling the snake oil of geoegineering as the magical cure for climate change. It gives the NWO cabal plausible deniability. After all, it was the geoengineering ‘experts’ who said that the widespread fabrication of chemcloud cover worldwide would appreciably reduce the warming of the planet. Fat chance … as just the opposite occurs. The study, published Tuesday in the journal Nature Communications, concludes that cloud cover can actually increase the amount of meltwater that runs off the surface of the glacier. Clouds have the effect of trapping heat on Earth; they can cause local temperatures to be warmer, so one would imagine that clouds might increase the amount of ice that actually melts during the day. But it turns out that the influence of cloud cover is strongest after the sun goes down. At night, the clouds actually prevent temperatures from cooling as much as they would on clear nights and keep already-melted ice from refreezing. This liquid water then pools on the surface of the ice and can be lost as runoff. The critical reason as to why they (TPTB) are stealing the sunshine is because they are conducting their own terraforming experiment. They care not what happens to the viability of the biosphere or to the general health of the inhabitants, both human and animal. Their disregard is so shocking, in fact, that many really do believe that a deliberate culling is taking place. Such a slow-motion genocide does not discriminate in favor of or against any particular race or religion; chemtrail pollution, with all of its bioengineered toxicities and weaponized contaminants, adversely affects the whole human race quite negatively. The unrelenting laying down of chemcloud cover has significantly changed the amount and degree of sunlight which reaches the surface of the Earth. This dynamic alone has considerably changed the normal microbial balance of ecosystems everywhere. 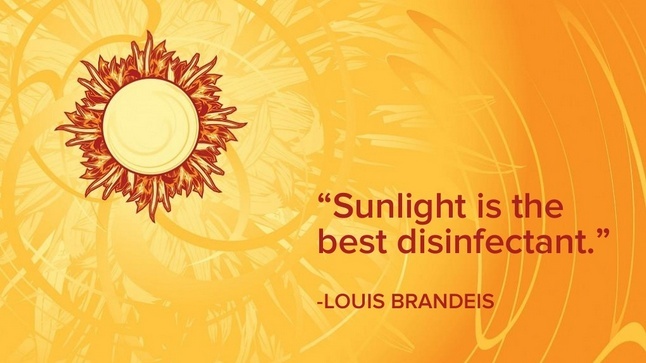 For instance, it is well-known that the sunrays function as the universal disinfectant. The UV component, in particular, will kill atmospheric molds and funguses, bacteria and viruses en masse. Because this normal process of nature’s disinfection and sterilization has been so thrown off balance, the ambient environment is now suffused with pernicious molds and opportunistic fungi. These immense and unparalleled proliferations are both airborne and on the land masses. The upshot is that there are now many more sick homes and sick office buildings than ever before. The unrelenting chemcloud cover also keeps the airborne pathogenic microbials closer to the land surface. The same goes for the coal fly ash that is sprayed in the lower stratosphere and upper troposphere. The real problem with this unfolding scenario is that some of these pathogenic micro-organisms are either newly bioengineered or they are mutating very quickly, thereby avoiding certain identification. For individuals who are particularly vulnerable, they can be overrun by these biological assaults and have no idea what they are truly up against. In those cases, where the pathogenic micro-organisms have been purposefully bioengineered to target a specific gene pool, the health consequences will certainly be much greater as they often go undetected for months, years and even decades. What is crucial to understand is whether an individual has a selective susceptibility to either the airborne toxic molds or land-bases fungi which are now seriously out of control. Whenever different folks are confronted with a completely unfamiliar health challenge or medical dilemma, they ought to seriously consider these offending agents which now permeate the ambient environment. 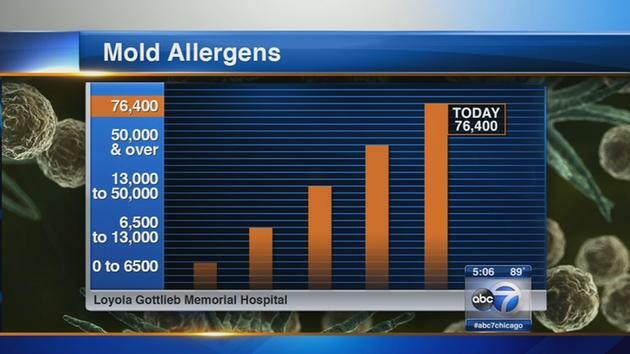 Newly acquired mold allergies are particularly vexing and problematic. The good news is that the home can be remediated and maintained in such a way so as to minimize the aforementioned intrusions of chemtrail residuals and toxic microbials. Ultimately, those who survive these never-ending chemical and biological assaults will have evolved immune responses that are far superior to those who have never been exposed to the increasingly new toxic agents. 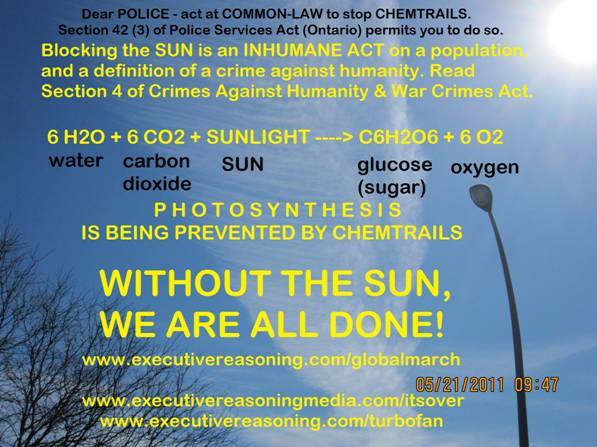 The same goes for the dangerous levels of chemically-mobile aluminum which now pervades the planetary environment from the constant chemtrailing. This is the first generation that has ever been confronted with such a formidable detoxification challenge. Heretofore, aluminum has been safely locked up in the Earth’s surface. Now that coal fly ash is continually disseminated by the chemical geoengineering programs worldwide, the alumina has been transformed into a chemically mobile state. This airborne aluminum has caused a pandemic of brain diseases and neurological ailments. Who has not experienced the ravages of early onset Dementia or Alzheimer’s disease in their own family? Who has not seen friends and communities challenge by ADD and ADHD, Asperger’s and Autism? Who has not witnessed the dramatic uptick in neurological disorders like Parkinson’s disease and Muscular dystrophy, Cerebral palsy and Bell’s palsy, ALS and MS, Guillain-Barré syndrome and Chronic fatigue syndrome. All of these health challenges and medical ailments require one thing nearly above all else—therapeutic levels of vitamin D in the body. The human body’s primary way of receiving adequate vitamin D is by manufacturing it in the skin upon contact with the Sun. Sunrays hitting the skin stimulate the biochemical processes necessary for vitamin D production. Factoid: Wherever there is less sunlight there is more cancer, flu, and autism. Vitamin D helps regulate cells, organs and organ systems throughout our body. In a class by itself, vitamin D turns genes on and off; a very basic function which distinguishes it from all other vitamins. At a minimum, vitamin D boosts the immune system by increasing the body’s antimicrobial peptides which are naturally occurring antibiotics that kill harmful bacteria and viruses. Vitamin D also strengthens teeth, making it a natural and suitable replacement for fluoride in drinking water and toothpaste. The numerous novel medical conditions which have emerged as the New Millennium Maladies are now many and growing. And, it is the artificial introduction of so many new chemicals and compounds, which have created a conducive environment for the pathogenic micro-organisms to proliferate and thrive. It is for these reasons especially that the current geoengineeering programs must be terminated post-haste. The entire Plant Kingdom requires the rays of the Sun to conduct its most basic functions of life. Growth and repair only occurs at the pleasure of the Sun; without it agriculture would cease to exist in its current form. Because of the chemical geoengineering operations across the planet the Plant Kingdom is being decimated by the reduced sunlight. Much of this physiological destruction is taking place under the radar. The delicate root structures for instance are becoming laden with aluminum which impedes the uptake of necessary nutrients and minerals from the soil. The way that water is absorbed by the roots is also being inhibited which is now routinely stunting plant growth. The following abstract recently appeared at PubMed.gov. 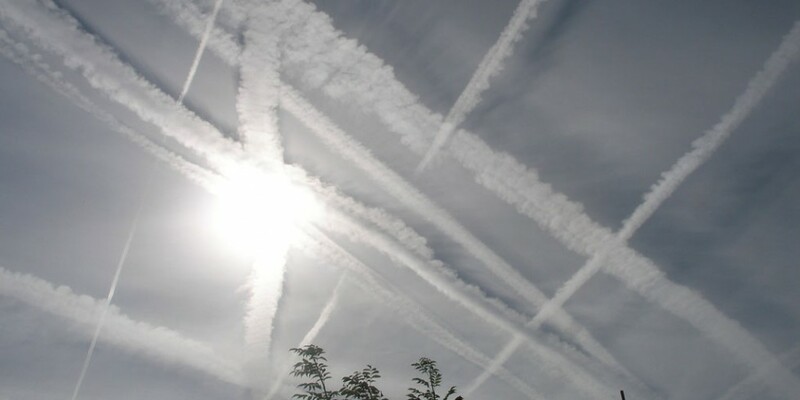 It is quite revealing in that it identifies specific chemical compounds and nano-materials which are now being sprayed into the atmosphere via geoengineering programs. Typically this type of scientific research has been kept from the public. 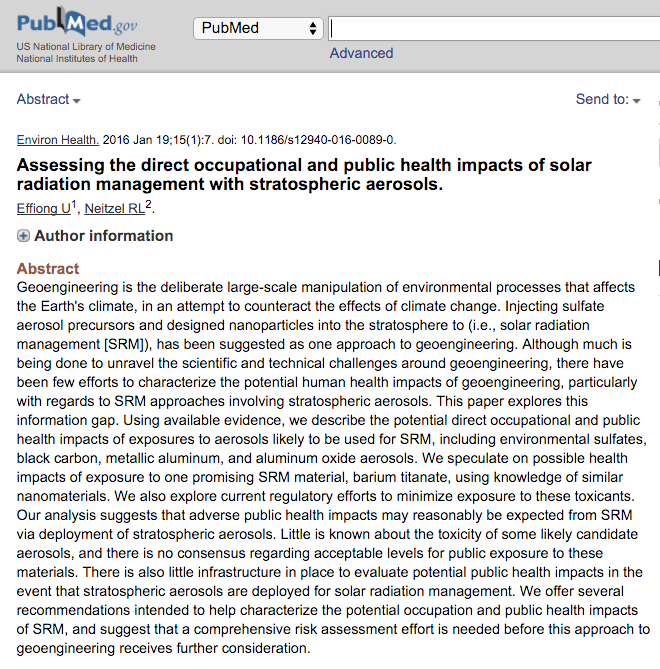 These two authors must have access to highly privileged information about the composition of chemtrail aerosols for this peer-reviewed paper to have been accepted for publication. And, yet, the government continues to deny the very existence of such pervasive chemical geoengineering programs. That denial will no longer work at confusing the public given the disclosures which are made in this scientific research paper. The global black operation seen everywhere as chemtrail spraying is now officially no longer a secret. The biosphere has been altered in profound and fundamental ways by the perpetual spraying of noxious chemtrails throughout the atmosphere. As the global environment undergoes unprecedented destruction, the ecosystems of the world are sustaining irreparable damage. The longer these misguided geoengineering programs continue, the more difficult it will be to remediate the awesome devastation that is occurring imperceptibly around the globe. Hence, there is only one solution to this full-blown planetary catastrophe. The following link ought to rekindle anyone’s appreciation for the benevolent and life-sustaining sunlight. Perhaps by its widespread dissemination others, too, will awaken to this most important of all the light-emitting orbs in our sky.